First of all, the job as assistant professor is all mine, but the baby is very much shared with my husband. Earlier this year I gave birth to a baby boy and two months later I started my new position as an assistant professor in biology at San Francisco State University. Several people have asked me how I managed to combine the baby and the new job and not go insane (*). Here are some of the things that made it possible. 1. My husband, because he never thinks that taking care of a baby is something that only women should do. 2. Facebook, the company where my husband works, because they give men and women four months of parental leave to be taken any time during the first year. Knowing that my husband could take time off during my first semester as a professor made a big difference, because we didn’t know how things would work out with work, teaching, nanny, and baby. Without the generous parental leave from Facebook, I would not have started my job this semester, instead, I would have started the new job 6 months later. Also thanks to his parental leave, he and baby could travel with me to the conference I went to on the East Coast. 3. My colleagues at SFSU because they did not put any pressure on me this semester. They understood when I missed department meetings or when I didn’t show my face on campus for days in a row. Maybe it helped that many of the professors in my department are women with kids. 4, Professional help. We live far away from our families, so we depend on professional help with childcare. We had a night nanny early on, which really helped us get some sleep. Then when the baby was two months old we hired a full-time nanny. We could not have combined work and parenting if we wouldn’t have hired these amazing professionals. 5. Saying no. I only taught one class. I did no reviews. I started no new projects. I accepted only one student in my lab and this only in the second half of the semester. I didn’t buy furniture for my office space yet. I didn’t go to our departmental seminars. I only had lunch with colleagues a few times. These things will have to change next semester! 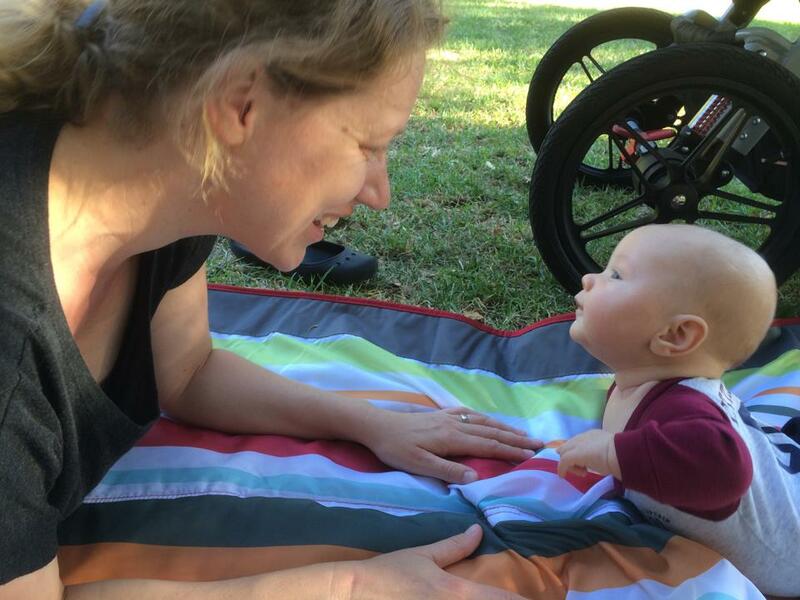 *I think that often, behind such a question (“how do you do it?”) is the tacit assumption that I, as the woman, do most of the caring for the baby. This is not the case. My husband does just as much, if not more. So if you are wondering how it was for me to go back to work after two months of being at home with our newborn, you should really be asking my husband the same thing. Maybe he’s interested in writing a blog too. A few weeks ago This week my students wrote short essays about the infamous Hersft et al 2012 paper on airborne Influenza A in ferrets. For months, this paper was not published (even though it was accepted for publication) because it was unclear whether the results should be published at all, for fear that terrorist groups would use it to create a dangerous flu strain (see here). In my class, all students read the same paper, but they each have a different assignment. Figure 4 of Herfst et al 2012 Science. I thought this paper was a little slow but it was very interesting. The idea of an airborne virus has plagued mankind for centuries and according to the article, there is a possibility for viruses to mutate enough to become airborne. I liked how the article explained in detail what influenza is and its nomenclature. I thought it was interesting that the research group was able to produce an airborne virus but I do not understand why they would help a virus evolve to that state. I think the results are important but I wonder if the experiment will be redone. The main conclusion of the paper was that A/H5N1 influenza virus has the capability to become airborne transmissible in ferrets. Studies such as the one conducted in the paper are denoted as “gain of function” and the authors used this approach to genetically modify A/H5N1 virus and then used the modified virus during serial passage in ferrets. The authors concluded that four amino acid substitutions in the hemagglutinin protein and one mutation in the polymerase complex were all present in airborne-transmitted virus isolates. This paper is extremely relevant to health and medicine because it holds the potential to provide insight into a virus’s capacity to become airborne and cause explosive disease, and this information will allow scientists to begin developing therapeutics to alleviate such a situation. I do not believe that this paper will have an impact on current patients because the research carried out in this study did not lead to any novel treatments. In this paper, the authors wanted to investigate the possible mutations in avian influenza A/H5N1 which could lead to the possibility of airborne transmission between humans. In order to test this, the investigators performed targeted mutagenesis and serial virus passage in ferrets to determine whether the mutations made provide a sufficient substrate to allow for development of airborne transmission. The primary source of data for the experiment(s) came from throat and nasal swabs, as well as nasal washes which were then tested for viral load via end-point dilution in canine kidney cells. For the serial passage experiments, such samples were collected for each individual in the transmission chain. 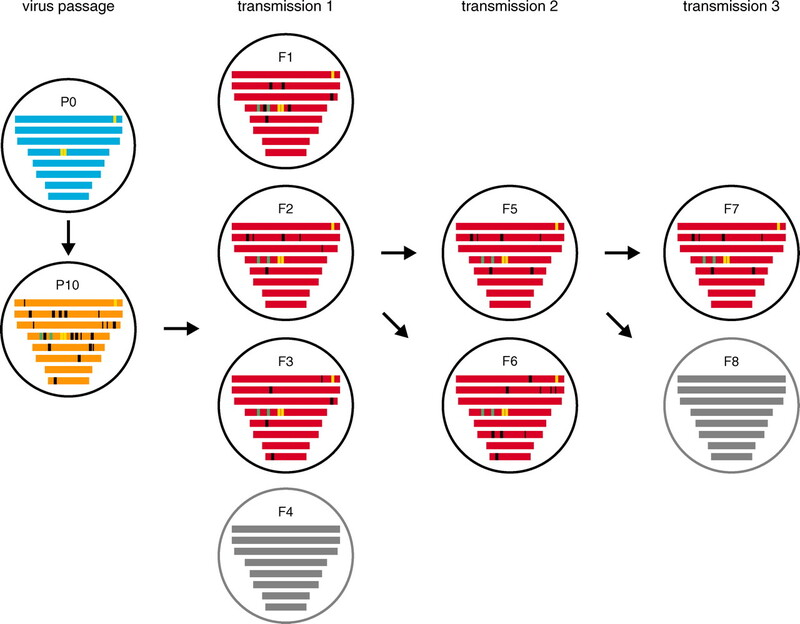 Viral quasi-species from each sample were characterized using 454 pyrosequencing, and viral genomes obtained using Sanger sequencing for experiment 4. In total, this paper used a variety of genetic, immunologic, molecular and bioinformatic (sequencing analysis) techniques to address the question of airborne transmission acquisition in avian influenza. There is scant detailed discussion about any of the individual analyses used in this paper, but clearly some amount of basic statistics must have gone into the generation of significance values and the like. I just finished a book by the Dutch author Rascha Peper, called “Handel in Veren”. I really like the book. Peper is just an amazing storyteller! Peper died last year and it was not clear if she would be able to finish this book. In fact she was planning to write a series of two books but she only finished the first one. One of the things I like about this book is that two of the characters in the book are biologists. Her descriptions of these scientists are really great. I think she must have known a few scientists really well to be able to write about them so accurately. One of the scientists in the book is an evolutionary ecologist who works in the Netherlands. He works on fluctuating asymmetry and is obsessed with his h-index, which is 60. Even though he’s not the main character in the book and only a few pages are about him, it becomes clear that he started off as a well-meaning and honest scientist but then he turned into a fraudulent and cynical senior scientist. The second book, which Peper never wrote, was supposed to be mainly about this character. I think I would’ve loved to read that book. It is fun to think about who could’ve been this scientist. In an interview, Rascha Peper says the character is like Diederik Stapel, but Stapel was not a biologist. When I hear fluctuating asymmetry, fraud and a high h-index, I think of the Danish scientist Anders Paper Möller (h-index 113!). Moller was accused of scientific fraud and had to retract a paper from Oikos. I guess we’ll never know for sure who the character was based on. If you can read Dutch or German, I recommend reading anything by Peper! At least two of her other books feature scientists too (Rico’s Vleugels (which I didn’t read) and Wie Scheep Gaat). As far as I know, no English translations exist. One of the students in my class (Arturo Altamirano) as he is giving a talk about Influenza virus. The drawings on the whiteboard were a very helpful for understanding his presentation. One of the things I did in my seminar this semester was to prohibit the use of Powerpoint or any other presentation software. For their talks, the students had to use the whiteboard or handouts or anything that didn’t require a projector. Most of them used the whiteboard. Initially some of them didn’t like it much. But every student had to give three short presentations during the semester and so they had a chance to improve their whiteboard skills during the semester. I asked them not to use Powerpoint because I wanted to make sure that they did not spend a lot of time preparing beautiful slides. Instead, I wanted them to you to focus on the story of their presentation and the connection with their audience. I’m happy that I made this decision because the presentations that students did were really nice and I think they wouldn’t have been as good if I had allowed Powerpoint. All of the students improved their presentation skills during the semester and as the semester progressed, it got more more fun to listen to their talks. One thing I will do differently next time is that I will start the semester with some exercises to become familiar with using the whiteboard. I am thinking about asking each student in the first class to introduce themselves using the whiteboard. For example, they could draw (very roughly) the geographic location of the cities or neighborhoods in which they have lived. The exercise would be to combine drawing on the whiteboard and talking to an audience. And hopefully, such an exercise would take away some of the fear they may have about talking without slides. 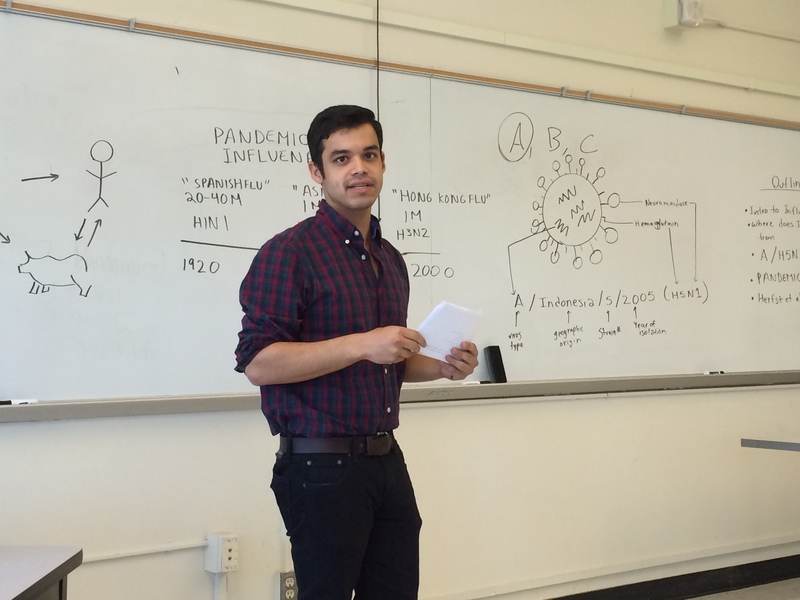 The picture I attach to this blog is of one of the students in the class (Arturo Altamirano) as he is giving a talk about Influenza virus. The drawings on the whiteboard were a very helpful for understanding his presentation. Yesterday it was the 1st of December, and I almost forgot that it was world AIDS day! However walking around on the campus of SF State University (where I work) reminded me of the day it as. 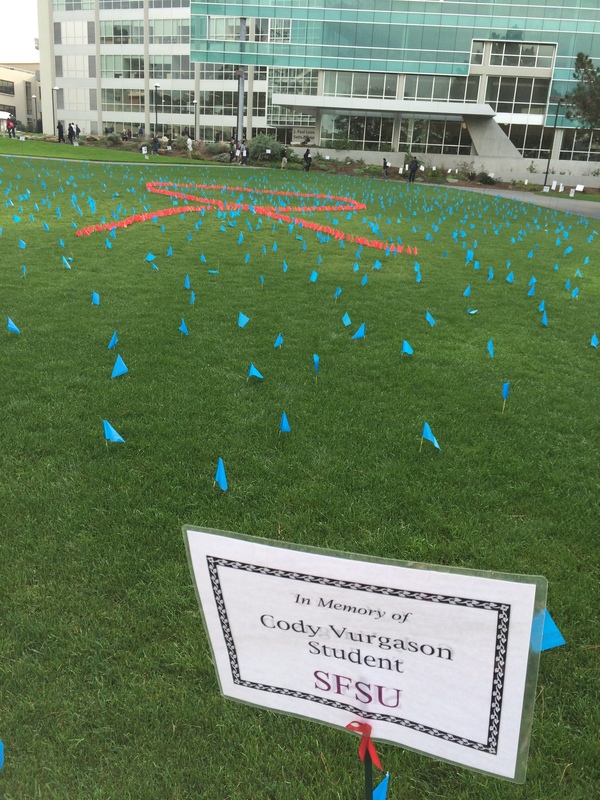 On the central lawn of the campus red and blue flags were planted in the shape of an aids ribbon. Surrounding the lawn along the path, there were white labels with names of people who died of AIDS. Some of these people were students or staff of SF State University. Others were well known people, such as Nelson Mandela’s son, Makgatho Mandela. 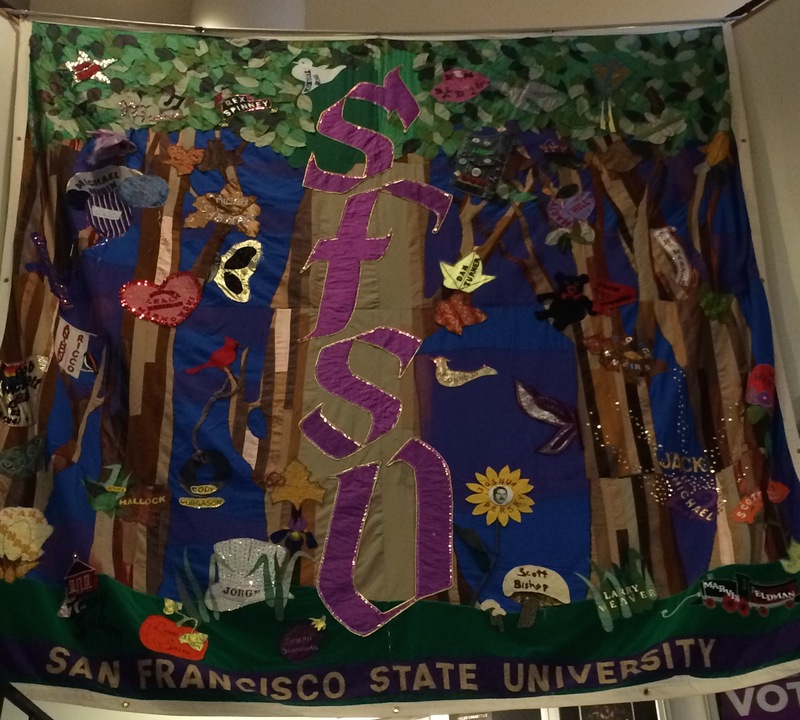 In addition, in the student union the SF State AIDS memorial quilt is on display, with names of people from SF State who died of AIDS. 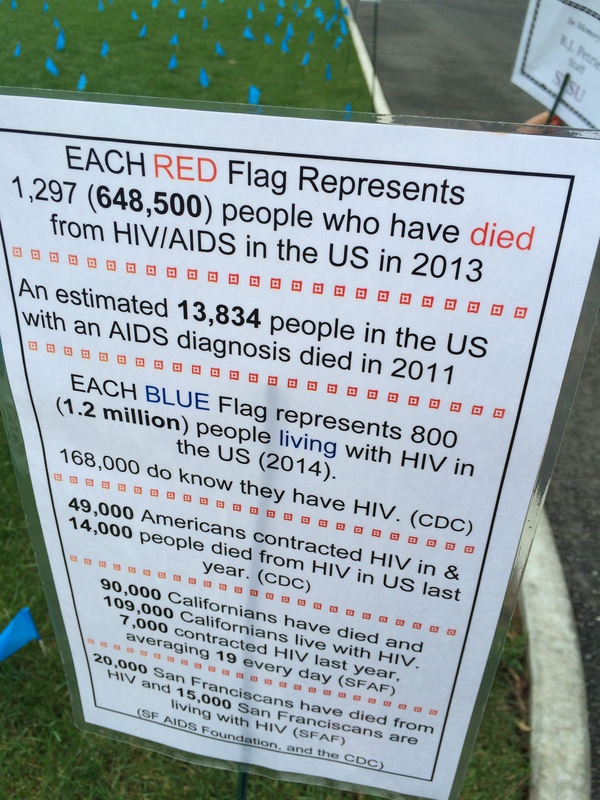 The sign next to the quilt explains that Cleve Jones, who started the AIDS quilt was also an SF State student. 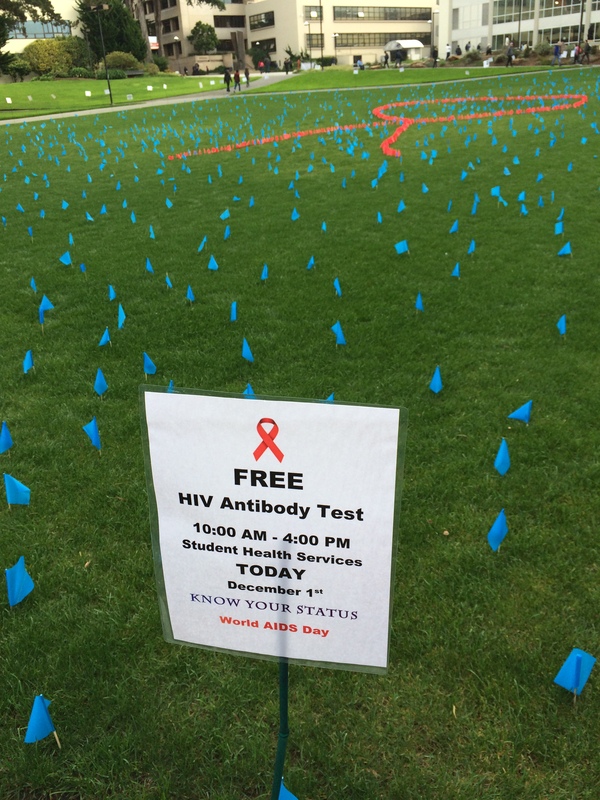 Finally, the university health services offered HIV testing yesterday. Testing is extremely important, because many people in the US do not know they are infected with HIV and these people may unknowingly infect others. If you’re looking for a place to get tested in San Francisco, check out the website of the San Francisco AIDS Foundation. I attach some pictures to this blog.